Walk into the workshop of most master leather workers and you will find belts, holsters, and any number of items used while riding the range of the American West. Jeff Icenhower’s workshop was no exception five years ago, when Jeff turned his longtime hobby into a business. Before long, however, friends in the Colorado Arts & Crafts Society stirred his interest in the leather work of the Arts and Crafts movement. This leather clock by Jeff Icenhower follows the style of the Arts and Crafts movement that began more than a century ago. Jeff studied everything he could find about the movement. It started in England in the 19th century, he told me, as a revolt against the impersonal character of industrial production. William Morris, the icon of the Arts and Crafts movement, championed fine craftsmanship, simple form, and motifs found in nature. 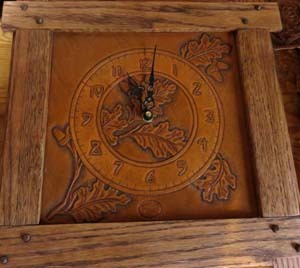 The mantel clock Jeff made (pictured above) exemplifies Morris’s points. 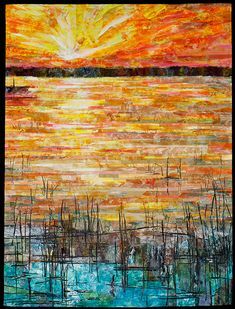 I discovered Jeff’s work late in April at the annual “Gathering of the Guilds” sponsored by the Colorado Arts & Crafts Society. He was the only exhibitor of leather – a fact that reflects the scarcity of leather workers in Arts and Crafts in this century. The tools and skills required, however, are identical to those used in American Western leather work, and Jeff slips easily between the two styles. Jeff purchases large pieces of leather tanned with vegetable matter rich in tannins. 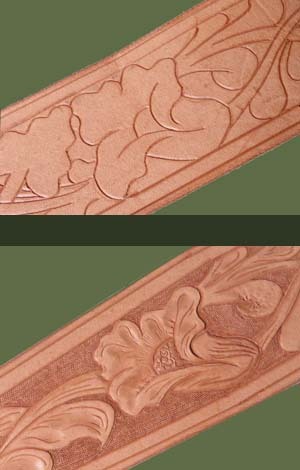 It’s the one kind of leather suitable for carving and stamping designs. Before he can begin his design work, he not only needs to cut the shapes he wants, but he also has to “case” the leather. That means dipping it in water and letting it dry again – but not completely. He recognizes a buttery feel in leather that has dried to the point of being workable with design tools. Jeff Icenhower demonstrates the tool used for leather carving. He has the basic outline of his design ready on a piece of paper. He lays the paper on top of the cased leather and traces the lines with a ballpoint pen. When he lifts the paper, there’s just enough of a dent in the leather to guide him through the actual carving of the design. Tools for leather working haven’t changed in hundreds of years. 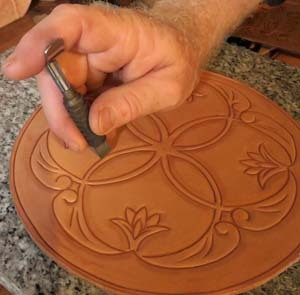 An exception is the tool for carving — the swivel knife Jeff is holding in the picture of the round mat. He keeps it steady by resting his forefinger on the top. The lower part of the tool, controlled by his thumb and middle finger, pivots as he guides it along the curves of the design. The beveled edges characteristic of designs in fine leather work are added later by following the carved lines with a special tool made to press the leather at an angle. Jeff Icenhower carved the basic outline on this belt using lines he traced from a design on paper. 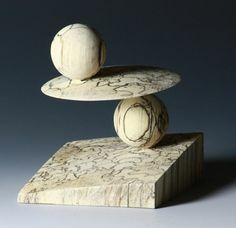 He added fine detail with carving tool and small metal stamps painstakingly positioned and pressed. In this picture of a belt in progress, you can see how simple the basic design is that Jeff traced through paper. Fine detail in the lower picture he added free hand. He used his carving tool to create the long lines on leaves and petals. Other details, like the flower center and the background, were made by repetitive pressing of small metal stamps, painstakingly positioned to maintain the clean lines of the design. To Jeff the point of leather working would be lost if he used the large design stamps that are available. 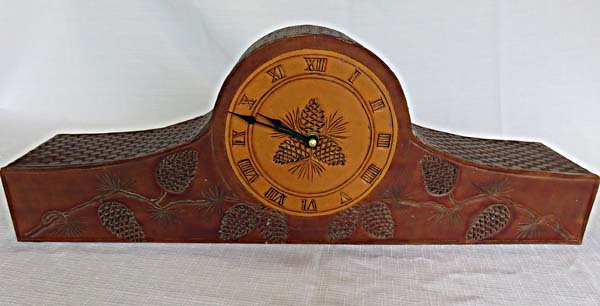 The pine cones on his mantel clock look so perfect, and the detail is so minute, I wondered when I first saw it whether he had a variety of pine cone stamps. Not so. 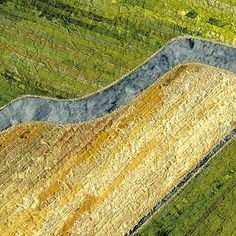 For each one, Jeff carves a series of parallel diagonal lines and uses a special stamp to create tiny diagonal lines between them. Together Jeff and I estimated that he had used his basket weave stamp about 280 times across the top of the clock. Such meticulous detail is a quintessential example of craftsmanship within the Arts and Crafts movement. Leather work of the early Arts and Crafts movement included bookends and book bindings, photo album covers, and handbags. 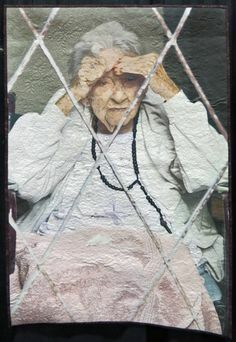 It also produced clocks, frames, and mats to put under lamps and books; Jeff is concentrating on these items in particular as he shifts his focus from American Western to Arts and Crafts. A frame, Jeff told me, can be completely covered in leather, or it can have carved leather laid into the wood. 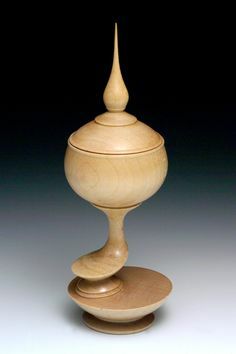 Items that can be decorated by carving wood – like the top of wooden boxes or the sides of bookcases – can also be decorated with carved leather. The wall clock pictured above is an example. 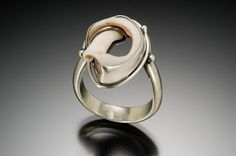 Jeff hopes to collaborate with artisans working in other media as he continues to explore working with leather as it relates to the Arts and Crafts movement. His workshop is located in Fort Collins. To see more of his work and to contact Jeff, check out his website at Mission West Wood and Leather. You can also watch for new work on the Mission West Facebook page. 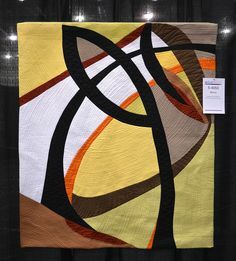 On June 17, Handmade on the Front Range will feature another artisan who adheres to the principles of the Arts and Crafts movement — weaver David Johnson of Thornton. New posts appear on the blog every other Wednesday. This entry was posted in Other and tagged Arts and Crafts movement, leather working on June 3, 2015 by Sally.